Nowhere in our industry is there a more meaningful recognition of excellence in strategy, creativity, innovative solutions, and business results, than the TMSA Compass Award. Start thinking now about your entries for the 2020 program. Your entry will articulate the goals, strategy and implementation of your project and demonstrate how the results were measured against the goals. The entry will also include samples of your work, such as brochure layouts, websites, or ads; video files; news releases or other written documents; sample sales scripts; photography of trade show booths or events; or screen captures of CRM forms. Members and non-members can enter work that took place in the past 12-18 months. Entrants include top management, strategists, practitioners, and tacticians. Compass entries are judged by industry peers, nationwide. All entries are evaluated using a proven six-point scaling system. 50 percent of your score will be based on the Program Blueprint; a written description of the project goals, strategic plan, tactics, and measurable results. The other 50 percent of your score will be based on the Program Work Samples. Point totals determine Awards of Excellence or Awards of Merit. > Watch these fun & creative acceptance videos! 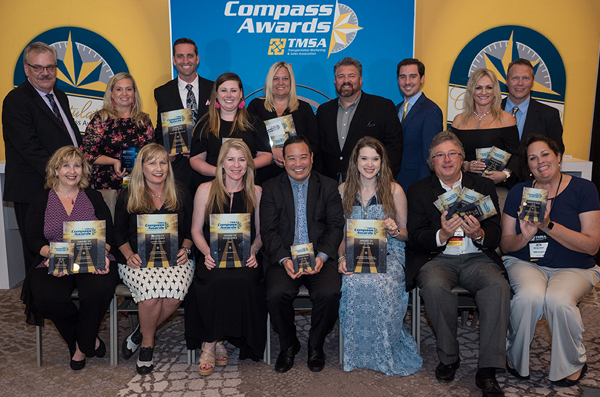 Compass winners are announced during a gala dinner at the TMSA annual conference in June. Each winner is presented with a trophy and has an opportunity to share an acceptance video.